This entry was posted in ads advertising collectibles and tagged BSSP on December 27, 2012 by James Day. WELL, SO MUCH FOR THE 2014 MODELS. According to the Mayan calendar, the world ends today, so this could be your last chance to get behind the wheel of a new MINI. Right now you can pay just $0 down to motor* in a 2013 MINI. So, if the world ends today in accordance with Mayan prophecy, you pay nothing. Ever. And if you’re holding out for a 2014 model, here’s a little hint: that’s a bad idea. Good luck. Bye. Correction: In the December 21st issue of this newspaper, we ran an ad referencing the imminent destruction of the world as predicted by the Mayans. It has come to our attention that the world did not, in fact, end. Good news all around. You can still take advantage of our $0 to Motor lease* offer on a new MINI. But in light of the world not ending, you will have to make the payments. MINI USA joined in the Mayan calendar end-of-the-world fun with these two full-page print ads in the The New York Times. The first, “WELL, SO MUCH FOR THE 2014 MODELS.” appeared on December 21, 2012, the last day of the Mayan calendar cycle. The second, “WE’RE STILL HERE!” was a “correction” ad and appeared the following day. More clever ads from Butler, Shine, Stern & Partners. 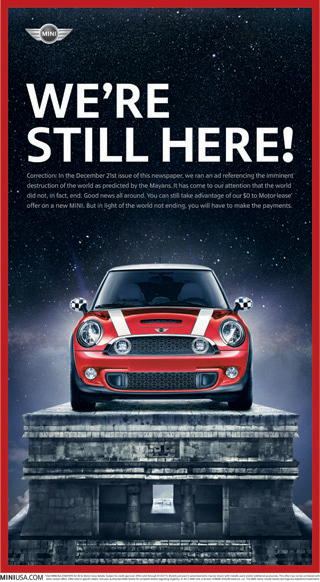 Download the original images and read the MINI USA NEWS press release WE’RE ALL STILL HERE… LET’S MOTOR.